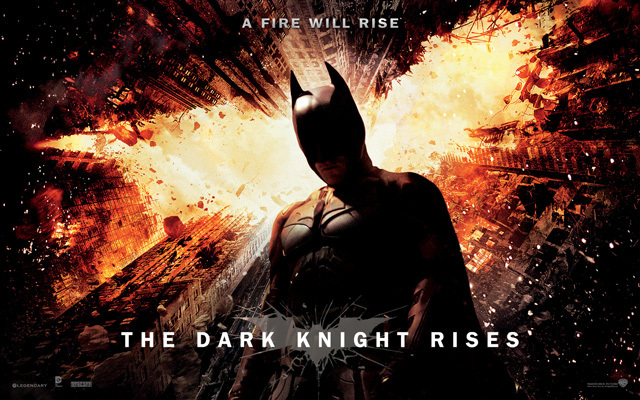 10 Things You Might Not Know About THE DARK KNIGHT RISES | Warped Factor - Words in the Key of Geek. Geek Dave can be anyone. Even a man doing something as simple and reassuring as putting a coat around a young boy's shoulders to let him know that the world hadn't ended. 1. Following the success of the Joker in The Dark Knight, Warner Bros. studio executives wished for the Riddler to be included as the primary villain as he was considered a similar character, and suggested to Christopher Nolan that Leonardo DiCaprio or an actor of his caliber should be approached for the role. 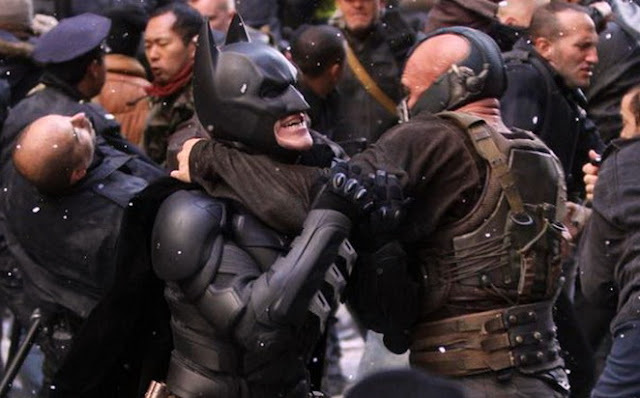 However, Nolan wanted the antagonist in The Dark Knight Rises to be vastly different from the previous incarnations and decided to using Bane instead, citing the need for a character with a physical presence within the film. When comparing the choice of Bane with the Joker, Nolan highlighted the Joker as an example of "diabolical, chaotic anarchy and has a devilish sense of humor", juxtaposing him against Bane, who he likened to "a classic movie monster [...] with a terrific brain." 2. Nolan once again wrote the script with his brother Jonathan and David S Goyer. He drew inspiration from Charles Dickens' 1859 novel A Tale of Two Cities, which centers around the French Revolution. This homage to Dickens was briefly illustrated during one of the scenes involving the Kangaroo Court where Bane can be seen sitting in the rear of the courtroom inconspicuously finger knitting paracord, symbolizing his literary character Madame Defarge, and more overtly by Commissioner Gordon's eulogy for Bruce Wayne at the end of the film, which is taken directly from the classic novel. "The choice of the accent is actually a man called Bartley Gorman, who was a bare knuckle fighter, a Romani gypsy. So I wanted to underpin the Latin, but a Romani Latin opposed to Latino." But Gorman wasn't just a bare knuckle boxer, he was the bare knuckle boxer! An English-born Traveller of Welsh and Irish descent, Gorman was the undefeated bare-knuckle boxing champion of the United Kingdom and Ireland, often referred to as King of the Gypsies. Between 1972–1992, he reigned supreme in the world of illegal gypsy boxing. During these years, he fought in the street, in bars and clubs, on campsites, at horse fairs, in a quarry and even down a mineshaft! 4. Costume designer Lindy Hemming personally designed Bane's coat, taking inspiration from a Swedish army jacket and a frock coat from the French Revolution, it was designed to make Bane look like equal parts dictatorial and revolutionary. Hemming revealed he design was difficult as sheg struggled to find a tailor in Los Angeles who could work with shearling (the skin from a recently sheared sheep or lamb that has been tanned and dressed with the wool left on), it ended up taking two years to complete! 5. The Batsuit used in this and The Dark Knight consisted of 110 separate pieces, each of which had to be replicated dozens of times over the course of the production. The base layer was made of a polyester mesh that is utilized by the military and high-tech sports manufacturers because of its breathability and moisture-wicking properties. Molded pieces of flexible urethane were then attached to the mesh, to form the overall body armor plating. Carbon fiber panels were placed inside the sections on the legs, chest and abdomen. The cowl was sculpted from a cast of Bale's face and head to become a perfect fit for Christian Bale. 6. When she went to audition, Anne Hathaway believed she was there to read for the part of Harley Quinn. It was only after she had a discussion with Christopher Nolan that she found out that she was auditioning for Selina Kyle/Catwoman, a role she'd long coveted. Hathaway revealed that she was a complete nervous wreck after her audition, and the first time her agent phoned after her screen test he said he had good news and asked if Hathaway was sitting down. She immediately screamed "I'm Catwoman!" and ran around the room in a frenzy. Unfortunately, her agent had to calm the actress down because he'd actually called to let her know the equally good news - that she'd been invited to host the Academy Awards (which she did in 2011). Fortunately, later the same week, her agent phoned again to let her know that she had been offered the part of Catwoman as well. 7. Ryan Gosling and Mark Ruffalo were considered to play John Blake before Joseph Gordon-Levitt was ultimately cast. 8. 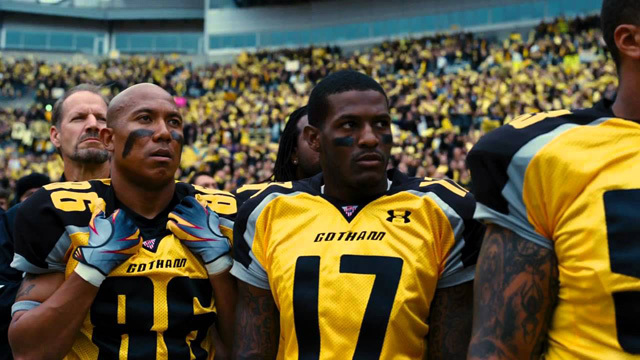 Several members of the Pittsburgh Steelers have cameo appearances as members of the fictional Gotham Rogues football team in the film, including Ben Roethlisberger, Hines Ward, Troy Polamalu, Willie Colon, Maurkice Pouncey, Mike Wallace, Heath Miller, Aaron Smith, Ryan Clark, James Farrior, LaMarr Woodley, and Casey Hampton, and former Steelers head coach Bill Cowher as the head coach of the Rogues. "I wanted to give them a chance to see the potential, because I think IMAX is the best film format that was ever invented. It's the gold standard and what any other technology has to match up to, but none have, in my opinion. The message I wanted to put out there was that no one is taking anyone's digital cameras away. But if we want film to continue as an option, and someone is working on a big studio movie with the resources and the power to insist [on] film, they should say so. I felt as if I didn't say anything, and then we started to lose that option, it would be a shame. When I look at a digitally acquired and projected image, it looks inferior against an original negative anamorphic print or an IMAX one." 10. On July 20th 2012, during a midnight showing of The Dark Knight Rises at the Century 16 cinema in Aurora, Colorado, a gunman wearing a gas mask opened fire inside the theater, killing 12 people and injuring 58 others. Police responding to the shooting apprehended a suspect later identified as 24-year-old James Eagan Holmes shortly after arriving on the scene. Initial reports stated that Holmes identified himself as "the Joker" at the time of his arrest.